Keynesian economics is fundamentally misguided because it focuses on how to encourage more spending when the real goal should be to figure out policies that result in more income. This is one of the reasons I wish people focused more on “gross domestic income,” which is a measure of how we earn our national income (i.e., wages, small business income, corporate profits, etc) rather than on “gross domestic product,” which is a measure of how our national income gets allocated (consumption, investment, government, etc). Simply stated, Keynesians put the cart before the horse. Consumption doesn’t drive growth, it’s a consequence of growth. But let’s set all that aside because we have new evidence that Keynesian stimulus schemes aren’t even very good at artificially goosing consumption. Three economists (from MIT and Tex A&M) have crunched the numbers and discovered that Obama’s Cash-for-Clunkers scheme back in 2009 was a failure even by Keynesian standards. The abstract of the study tells you everything you need to know. This is remarkable. At the time, the most obvious criticism of the scheme was that it would simply alter the timing of purchases. And scholars the following year confirmed that the program didn’t have any long-run impact. But now we find out that there was impact, but it was negative. Here’s the most relevant graph from the study. It shows actual vehicle spending and estimated spending in the absence of the program. For readers who like wonky details, here’s the explanatory text for Figure 7 from the study. 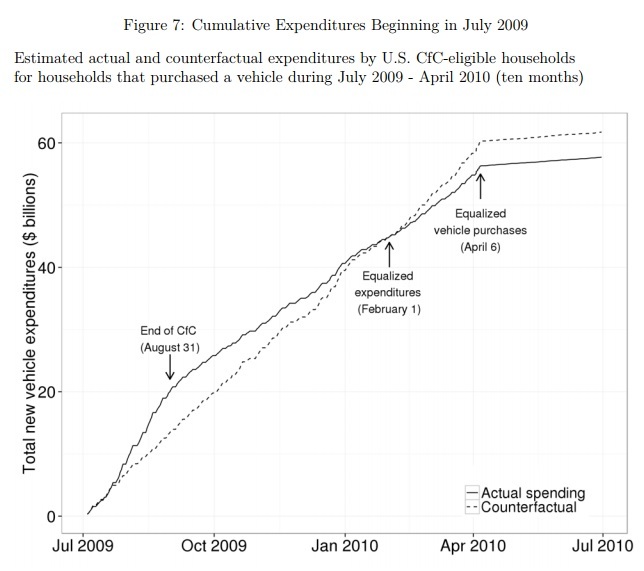 The effect of the program on cumulative new vehicle spending by CfC-eligible households is shown in Figure 7. The figure shows actual spending and estimates of counterfactual spending if there had been no CfC program. Cumulative spending under the CfC program was larger than counterfactual spending for the months immediately after the program. However, by February 1 the counterfactual expenditures becomes larger and by April has grown to be $4.0 billion more than actual expenditures under the program. It is difficult to make the case that the brief acceleration in spending justifies the loss of $4.0 billion in revenues to the auto industry, for two reasons. First, we calculate that in order to justify the estimated longer-term reduction in cumulative spending to boost spending for a few months, one would need a discount rate of 208 percent. Given the expected (and realized) duration of the recession, it seems difficult to argue in favor of such a discount rate. Second, we note that Cash for Clunkers seems especially unattractive compared to a counterfactual stimulus policy that left out the environmental component, which also would have accelerated purchases for some households without reducing longer-term spending. By the way, the authors point out that Cash-for-Clunkers wasn’t even good environmental policy. So let’s see where we stand. The program was bad fiscal policy, bad economic policy, and bad environmental policy. The trifecta of Obamanomics. No wonder the United States suffered the weakest recovery of the post-WWII era. P.S. David Letterman had a rather amusing cash-for-clunkers joke back in 2010. The excessive cost to offset the costs of carbon dioxide emission is a direct result of your refusal to allow more economically sound policies. We’ll either get a carbon tax, or a bunch of regulations intended to do the same thing that impose much greater costs. Don’t forget the most important long con consideration: ensuring that the majority of cars on the road are “modern” electronic “marvels” which just happen to enable the bureaucratic tracking of driver whereabouts. I don’t buy for one minute that the only effcts of CfC were on CfC-eligible households, and sellers of cars. As smapple mentions, the program took a lot of used cars off the market, but more importantly it removed a huge amount of parts from auto dismantlers’ inventories (and put many dismantlers out of business). This made it much more expensive for ordinary people — not just collectors — who still have old cars to keep them running (they will often have to pay to have substitute parts custom-made). The result of both these changes is mainly to screw the working poor. You missed one more. It was also bad social policy. There are two more things about the program that bothered me deeply. Firstly, the program removed from the buying public a source of decent used cars. All of those cars were the types of cars that the less-affluent of our society typically buy. Now they had a choice of either keeping a much older clunker going, or doing with out transportation. Because all of the vehicles within their price range of affordability had been removed from the road. Secondly as a car collector, I hate what it has done to the used parts market. A whole generation of good used car parts was removed from the marketplace. It was a requirement that the engines on these vehicles be run until they seized, and then the rest of the car was mandated to the crusher. This part never made ANY sense to me. So, this program made a dent in the normal operational fabric of society that will have implications in the decades to come as well. Don’t give them any ideas, or Californians will double down on their “Cash for Teslas” program.